Una occasione eccezionale quella che riusciamo a regalare al nostro pubblico con questo concerto: una performer incredibile, originale, interessante, intelligente. Uno di quei concerti per i quali si fanno chilometri…Veramente, veramente da non perdere. Di origini taiwanesi e dell’East Timor, Jen Shyu compone nel suo stile un puzzle di elementi che al primo sguardo sembrano indigeribili, tanto differenti sono le provenienze, ma che grazie ad un attento lavoro di ricerca trovano una loro peculiare unità. Un’identità determinata dall’incontro di tradizioni orientali a lei vicine (non solo Taiwan o East Timor ma anche Indonesia, Cina e Sud Corea) e di alcuni paesi dell’America Latina (Brasile e Cuba) che si fondono e si trasformano grazie ad una pratica improvvisativa di matrice jazzistica. Jen Shyu is a groundbreaking, multilingual vocalist, composer, producer, multi-instrumentalist, dancer, 2016 Doris Duke Artist, and was voted 2017 Downbeat Critics Poll Rising Star Female Vocalist. Born in Peoria, Illinois, to Taiwanese and East Timorese immigrant parents, Shyu is widely regarded for her virtuosic singing and riveting stage presence, carving out her own beyond-category space in the art world. She has performed with saxophonist and 2014 MacArthur Fellow Steve Coleman since 2003 and has collaborated with such musical innovators as Anthony Braxton, Wadada Leo Smith, Vijay Iyer, Bobby Previte, Chris Potter, Michael Formanek and David Binney. 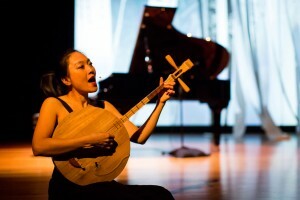 Shyu has performed her own music on prestigious world stages such as Carnegie Hall, Lincoln Center, Brooklyn Academy of Music, the Metropolitan Museum of Art, Rubin Museum of Art, Ringling International Arts Festival, Asia Society, Roulette, Blue Note, Bimhuis, Salihara Theater, National Gugak Center, National Theater of Korea and at festivals worldwide. A Stanford University graduate in opera with classical violin and ballet training, Shyu had already won many piano competitions and performed the Tchaikovsky Piano Concerto with the Peoria Symphony Orchestra by the age of 13. She has studied traditional music and dance in Cuba, Taiwan, Brazil, China, South Korea, East Timor and Indonesia, conducting extensive research which culminated in her 2014 stage production Solo Rites: Seven Breaths, directed by renowned Indonesian filmmaker Garin Nugroho. Shyu has won commissions and support from Doris Duke Performing Artist Awards, MAP Fund, Jerome Foundation, Chamber Music America’s New Jazz Works, New Music USA, Jazz Gallery, and Roulette, as well as fellowships from the Fulbright Scholar Program, Civitella Ranieri Foundation, Asian Cultural Council, Yaddo, MacDowell Colony, Korean Ministry of Foreign Affairs and Korean Ministry of Sports, Culture, and Tourism. Currently based in New York City, Shyu premiered her latest solo work at National Sawdust June 29, 2017, and releases her next album Song of Silver Geese on Pi Records November 2017, kicking off a 50-state U.S. tour of “Songs of Our World Now / Songs Everyone Writes Now (SOWN/SEWN),” planting seeds of creativity and threading communities together through art.